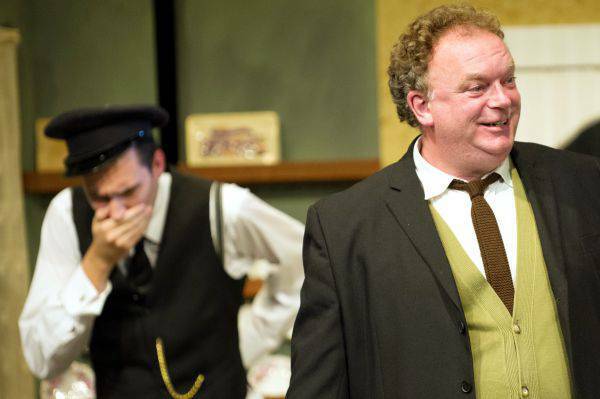 This is a hilarious dark comedy based on the famous Ealing comedy film of the same title. Posing as amateur musicians, Professor Marcus and his gang rent rooms in the lopsided house of sweet but strict Mrs Wilberforce. The villains plot to involve her unwittingly in Marcus? brilliantly conceived heist job. 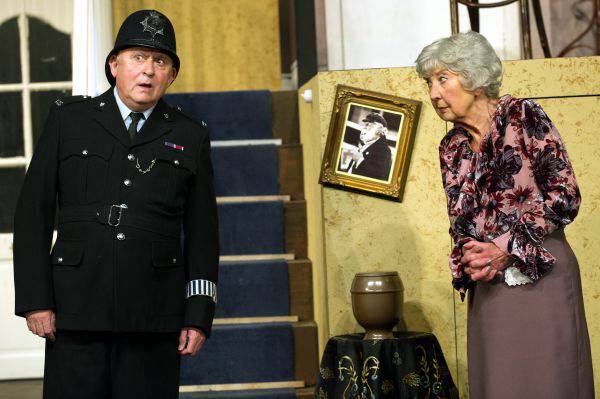 The police are left stumped but Mrs Wilberforce becomes wise to their ruse and Marcus concludes that there is only one way to keep the old lady quiet. With only her parrot, General Gordon, to help her, Mrs Wilberforce is alone with five desperate men. But who will be forced to face the music? This award winning comedy was recently seen in the West End. 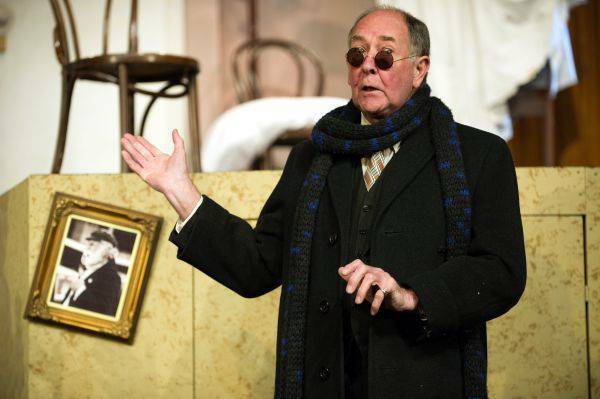 If you would like to have the latest Garrick News from this website e-mailed to you directly, then please subscribe to our News ‘blog’ on the?front page? and be sure of not missing any of our latest announcements and auditions news – or maybe join our Facebook or Twitter pages as well. 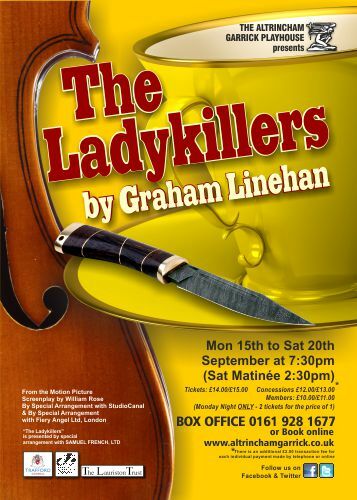 For an evening of far-fetched fun, you must see The Ladykillers at Altrincham Garrick. After a successful West End run and tour, Graham Linehan?s stage adaptation of the 1955 Ealing comedy has been released to amateurs. The tale about a criminal gang who rent an upstairs room from a gentile old lady whilst pretending to be a string quartet, is hilarious. The revolving set designed by Barry Fletcher, emulates well the original house. and the lighting and sound designers Trevor McKie and Christine Mills, accurately capture the effect of trains rattling by. Maureen Casket playing Mrs Wilberforce, steals the show when, totally unaware that her tenants are criminals rather than musicians, ?believes all their trumped up stories. When the miscreants get up to one of their funniest tricks, Mrs Wilberforce asks them why?? They reply ?We are artists? as though artists always do crazy things. In one unforgettable scene, the so-called musicians give a concert to Mrs Wilberforce?s middle class friends. In an outstanding performance, ? ?David Reynolds as Professor Marcus, seduces them with smooth words into thinking they have heard something wonderful. Wearing his Dr Who length scarf, David plays the role with charisma. Nick Sample?s Major Courtney - a cross dresser - coyly explains that donning a frock happened when he bumped into it when singing! The actors playing the other three criminals differentiate their personalities well. 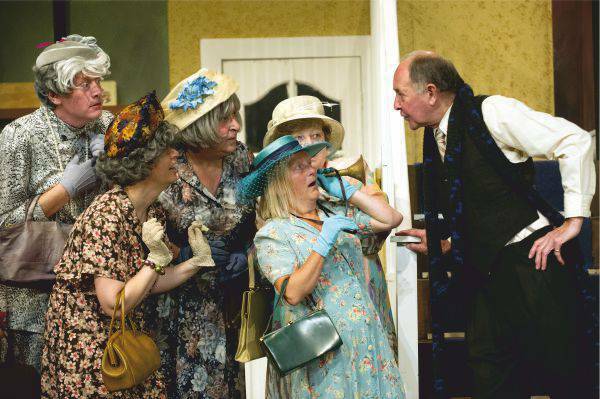 It is great news that Graham Linehan?s stage adaptation of the 1955 Ealing Comedy, The Ladykillers, has been released to amateurs. So, well done Altrincham Garrick for presenting it so soon afterwards. Their programme even contains a note from Marcia Warren who played the original Mrs Wilberforce. This amusing tale about a criminal gang who rent an upstairs room from a gentile old lady and pretend to be a rehearsing string quartet, is ideal for amateurs. I was concerned, however, about the ability of the Garrick set designer and his team to emulate the superb higgledy piggedly house used in the professional production. My concerns were fruitless. For the Garrick theatre?s revolving set is remarkably similar. Their house also has stairs and an upstairs room. Barry Fletcher and his team must have been working all summer to create such an edifice. Congratulations, too, to sound designer, Christine Mills. She has captured well, the rattle of trains passing the house. Lighting designer, Trevor Mckie does an equally good job. The five so called musicians are, of course, anything but. Take, for example, the not so bright, One-Round (Mark Leigh), who thinks cellos are held under the chin. In one unforgettable scene, the ?musicians? give a concert to Mrs Wilberforce?s middle class friends. Like in the Emperor?s New Clothes, the ladies believe they have heard something wonderful when what they have actually heard is something akin to tuning up. One Round has three other, equally untrustworthy friends. They are Romanian gangster, Louis Harvey (Daniel Ferguson), the pill popping Harry Robinson (Christopher Graham) and a superb Major Courtney. Played coyly by Nick Sample, he dons a dress using the excuse that he fell against it whilst singing! The miscreants are led by the self-styled Professor Marcus whose Dr Who length scarf is constantly being trodden on. 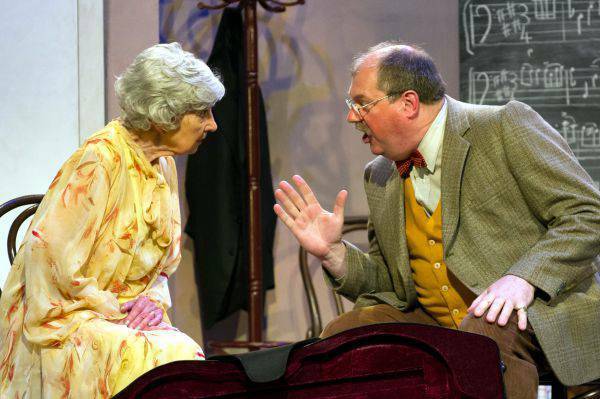 David Reynolds captures The Professor?s charming yet cunning style as he hoodwinks Mrs Wilberforce into believing every far-fetched scenario. The star of the show has to be Maureen Casket as the true lady amongst five dishonourable men. From the style with which she hands out tea in china cups to the gullible way she takes in the tales she is told, Maureen is a gem. She is the hub around which all the humour revolves. 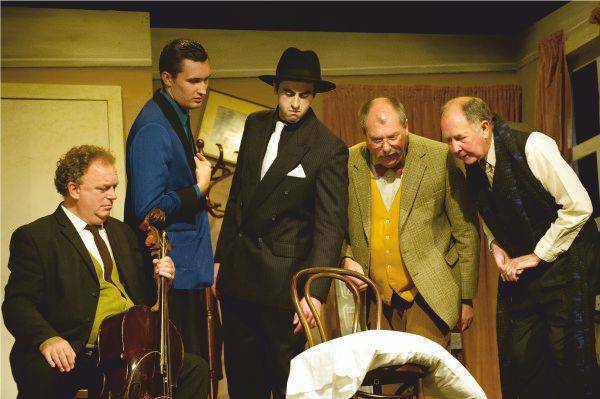 Adapted from the classic Ealing comedy starring Alec Guinness, the plot is near-perfect for stage farce; a gang of bank robbers hide out in King's Cross by disguising themselves as an amateur string quintet. The catch is not just their total inability as musicians, but their fatal undermining of their tea-making septuagenarian landlady, Mrs Wilberforce. 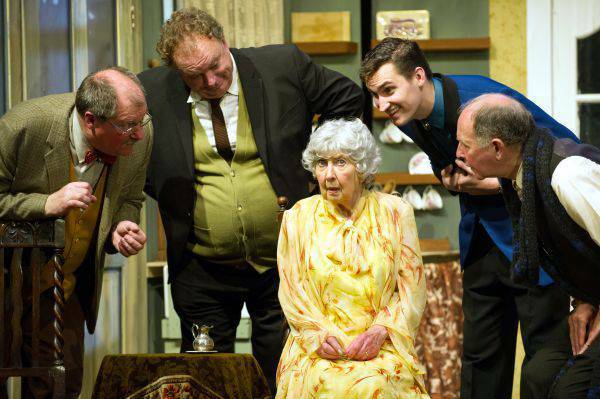 Playing the meddling matriarch is Maureen Casket, who brought the house down with her insistence that tea time is at 3pm, not 5. "Our tea time is early - we're old, we get up at 4.30!" The basic idea of criminal ?masterminds? coming a cropper at the hands of a sweet, innocent and bullet-proof ?oiled? lady is terrific and it?s this context which translates this piece beautifully onto the stage. The real star of the evening was Barry Fletchers? set; the aging King's Cross house which shakes and rattles performing its own minuet each time a train passes. Although impressive and grand, the set did incur a rather unforgiving visual problem with the window which was positioned in rather an awkward spot making it almost impossible for so many to see the majority of the show?s crucial instants. 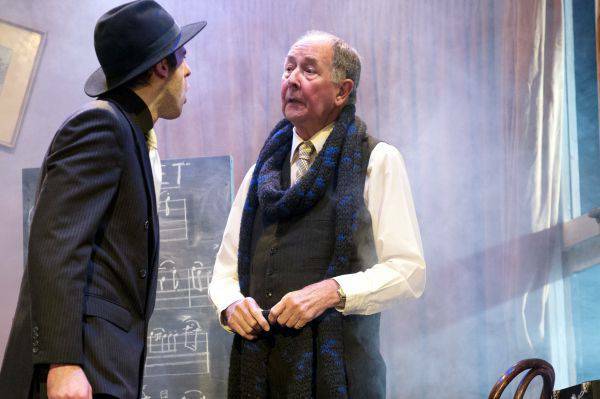 David Reynolds brings an original brand of sardonic irony to the criminal mastermind Professor Marcus, his performance was laced with sideways glances and a palpable 'big fish in small pond' frustration, though never managing to persuade me the man is a certifiable maniac. Mark Leigh offers the majority of the productions humour as the slow-witted One-Round, whose first instinct on seeing a cello is to tuck it under his chin. For me, the lighting design missed a trick as the attempt to create moods and ambiance was a missing factor, the production was lit too bright and cheery for this piece. The recapture of the shows unique zest was not quite ripe but as a whole this production is perfectly amiable with some solid performances and humour which were delivered to the full effect. ?Being fooled by art is one of the primary pleasures afforded the middle classes?, so it is - but there is no mistaking the genuine appeal of this classic parody. With this kick off to a brand new season and indeed the opening of the Altrincham Garricks second century, the society have welcomed some fresh blood amongst their membership and with a new?Chief Executive?at the helm,?straight away it?s clear that this theatre company have readdressed the brand of the playhouse with a plush new website and expert quality programmes, I'm certain that these changes are a just a glimpse of bigger things to come!